Oh hell yes, you've got to see this! John Stalberg's High School is about a high school valedictorian who accidentally smokes weed with the local stoner and finds himself the subject of a drug test. So how does he get out of it? He gets the entire school high so that he can get "his entire graduating class to face the same fate, and fail." The cast includes Colin Hanks (who I think is playing the valedictorian) as well as Andrew Wilson, Michael Chiklis, and even Yeardley Smith. But best of all, Adrien Brody plays a tattooed drug dealer named Psycho Ed. And he's looks frickin' crazy! Thanks to Quiet Earth we've got a few new photos. I have a feeling that this valedictorian kid is going to go to Psycho Ed and ask him to get enough weed to get the whole school high. Then he's going to tell him that much weed only exists somewhere. And he's going to go on an adventure to get that much weed. Hence the crazy broken windshield at the bottom. This is the first time I've even heard of this movie and f*ck yes I'm excited as hell to see it. These are the kind of crazy indie comedies I love! It's co-written and directed by John Stalberg, who's making his feature debut with this after directing a short film titled Mr. Dramatic. Maybe High School will premiere at Sundance? I can only hope! Out of curiosity why isn't Colin Hanks in any of these pictures? I agree with Christopher - he is at the age to be playing a teacher or something! This other kid from the AT&T commercials - even though an idiot in those and in Adventureland, will probably be the Valedictorian or his spunky side kick. I worked on this film, the valedictorian is the actor in the second image from the top, with the girl. Ha awesome love my stoner comedies. Is there a trailer yet? I'm stoked! The cornrows are a little Jared-Leto-in-Panic Room, but I'm still pretty stoked about this. But, I'll be real honest, that's probably got a lot more to do with seeing the name Michael Chiklis than anything else. God-DAMN am I a Shield junkie. Wow... out of ideas for movies? What a terrible thing to make a movie about. Trivializing drug use. This looks stupid. 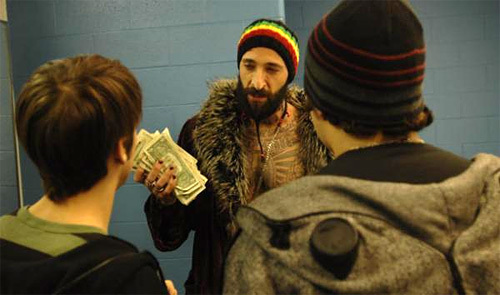 Brody as a drug dealer? Tatted up Michael Scofield style? With the kid from the Cingular commercials? Alex, please try to criticize more than 1 thing a week. The only cool thing about this is Yeardley Smith. 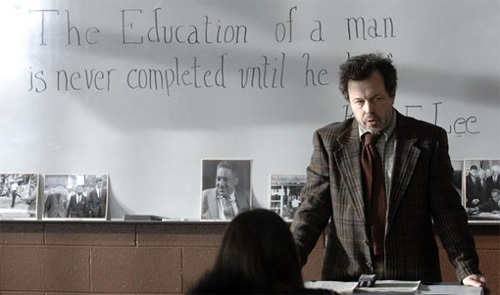 It's good to see Booger playing a high school teacher. But Colin Hanks would ruin it. The only reason he gets work is his dad. Plus he's like 35 years old and playing a high school student. Adrien looks so funny in these... i never heard of this film. anyone know when it comes out? This looks SIIIIIIIIIICK!!! Not heard of it til now, but def on my must-see list. Brody + cornrows = hilarious! haha... i LOVE stoner comedies... glad to see a new one is ready to come out! AMAZING! This will be a cult classic! Kimbo Slice in the movie? Adrian Brody looks so awesome. I just cannot possibly take Brody serious, something about him just makes me laugh when ever I read his name or see a photo of him and I don't mean in laugh positively. HAH! This movie was filmed in the town where I live! I actually went to the school that this toook place in! I just can't for the life of me find the trailer or teaser for this movie... Anyone wanna get me a link if they can? The school is really called Parker High in Howell Michigan. They filmed this with snow on the ground and they put fake leaves on the trees! A lot of my friends and classmates appear as extras in this movie so I can not wait to see it!